Welcome to my blog. 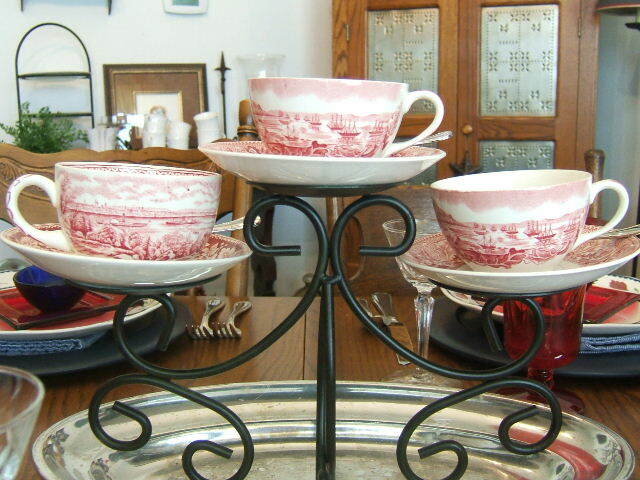 My lifelong love of dishes has evolved into haunting yard sales and thrift shops to feed my tablescaping hobby, the ultimate fantasy of a dishaholic. I hope to share with you my adventures in searching for dishes and their accessories – at the best price. 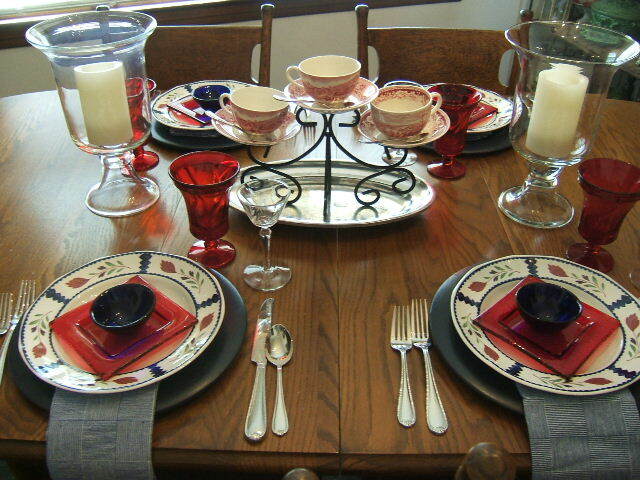 After all, part of the fun in tablescaping is the search for the best deal. Today was a really slow yard sale day. 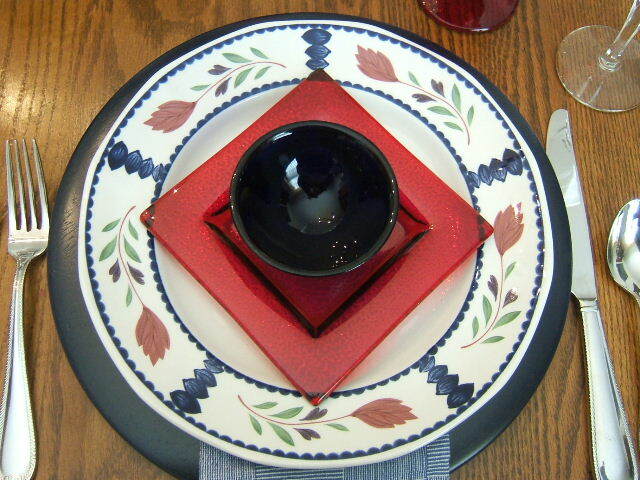 We did go to an estate sale where there were LOTS of exquisite dishes, mostly Noritake with gold designs. The woman selling them loved dishes, too. She easily had at least a service for twelve with multiple pieces in each setting. She had wrapped them so lovingly in bubble wrap and was still unwrapping her pretties, even though it was the second day of her sale. She was moving and selling off her household. I felt a pang of sadness for her as I thought how difficult it must be to say goodbye to your dish collection. Hard to believe, but I didn’t buy anything. The dishes and crystal were of a super nice quality; unfortunately her prices were way beyond what I pay. I didn’t want to insult her by offering any less. But…if I had a boatload of money, I could have done some damage there. At two separate yard sales, I managed to find a Harvest tablecloth for the kitchen table and a set of very chippy ceramic measuring cups. I bought the cups for their display purpose only as the chips would make them unusable for food. Since we were having our carport/family room roof redone today, we didn’t stay away from the house too long. 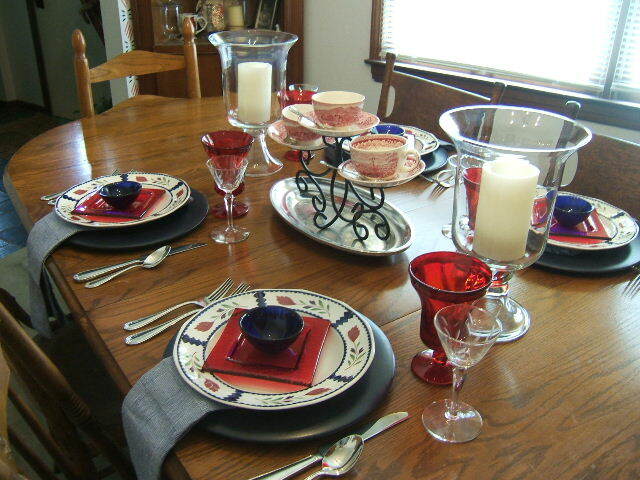 After doing a little (very little) cleaning, I decided to do a quick switch on last week’s blue tablescape in order to debut my new ruby red goblets. I changed out very few things. The chargers, silverware and napkins stayed the same. 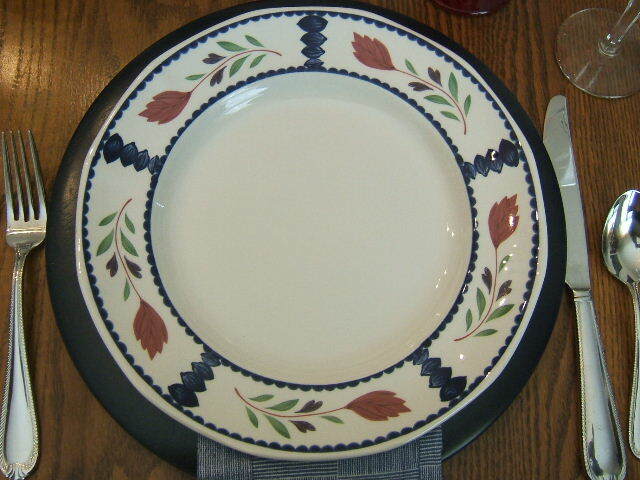 The dinner plate was switched out with an Adams Lancaster pattern. 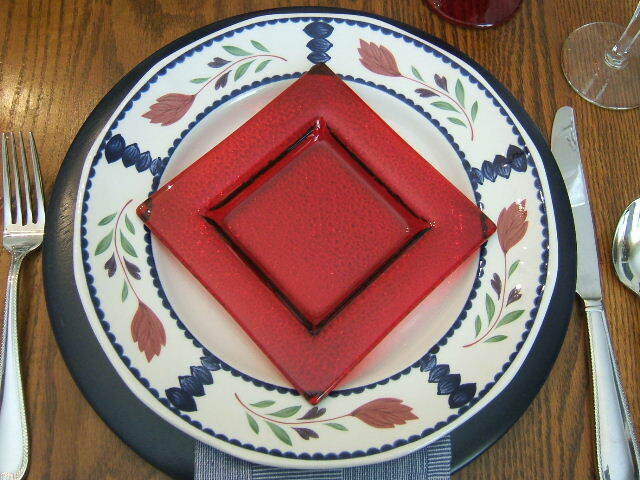 Then I layered red square glass plates from Fortessa and topped with the same blue Fortessa bowl from last week’s tablescape. 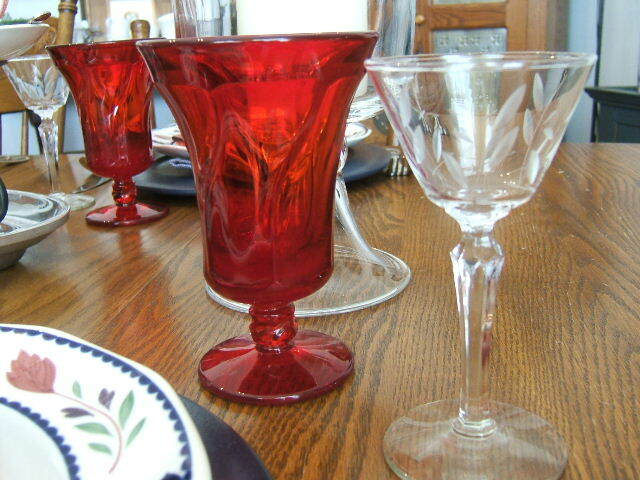 The cordial/wine glass remained and the blue goblet was switched for our star, the ruby red goblet. 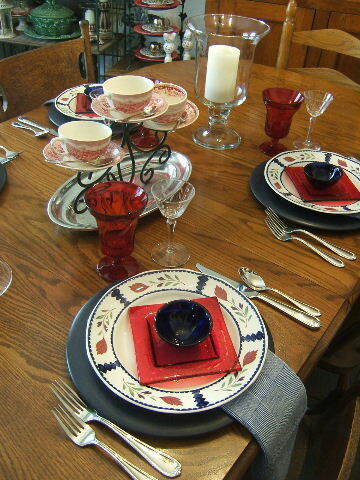 The centerpiece also had a switch to red as I removed the blue teacups and substituted with the red transferware cups. Simple and inexpensive changes to create a new look. Now I’m off to do some more cleaning and in the process, hope to find more dish storage areas…(I’ve got to have some kind of motivation to clean…). 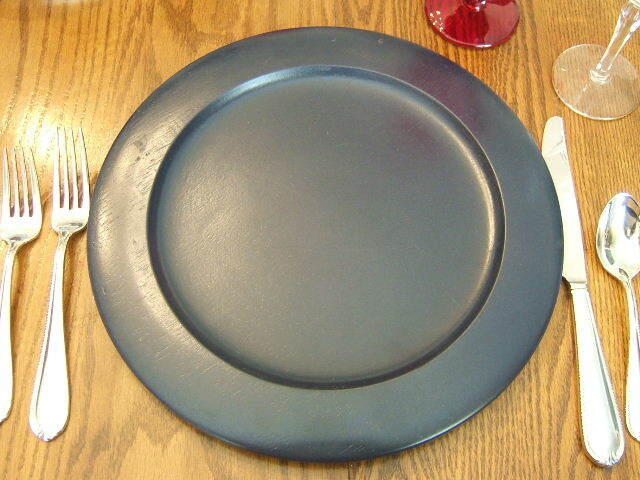 This entry was posted in Dishes, Garage Sales, Tablescaping, Thrifting, Yard Sales. Bookmark the permalink. Wonderful! I think this will be a plateful of fun.